Why is the Islamic world disengaged from science and the process of creating new knowledge? No major invention or discovery has emerged from the Muslim world for well over seven centuries now. 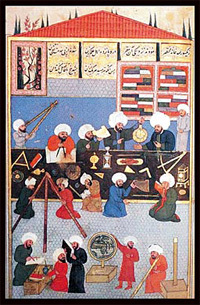 Islam's encounter with science has had happy and unhappy periods. There was no science in Arab culture in the initial period of Islam, around 610 AD. But as Islam established itself politically and militarily, its territory expanded. A generally tolerant and pluralistic Islamic culture allowed Muslims, Christians, and Jews to create new works of art and science together. But over time, the open-minded pursuits of philosophy, mathematics, and science were increasingly relegated to the margins of Islam. A long period of darkness followed. Muslim leaders today, realizing that military power and economic growth flow from technology, frequently call for speedy scientific development and a knowledge-based society. Scholars in the past claimed that Islam lacks an "idea system" critical for sustaining a scientific culture based on innovation, new experiences, quantification, and empirical verification. In the current epoch, most Muslims reject such charges. They argue that Islam sustained a vibrant intellectual culture throughout the European Dark Ages. Let us seek to understand the state of science in the contemporary Islamic world. First, I will quantitatively assess the current state of science in Muslim countries. Then I will look at prevalent Muslim attitudes toward science, technology, and modernity. Finally, we can turn to the fundamental question. The output of the seven most scientifically productive Muslim countries for physics papers, over the period from 1 January 1997 to 28 February 2007, together with the total number of publications in all scientific fields, compared with Brazil, India, China, and the US reveals significantly smaller numbers. The 57 countries of the Organization of the Islamic Conference (OIC) have 8.5 scientists, engineers, and technicians per 1000 population, compared with a world average of 40.7, and 139.3 for countries of the OECD. Forty-six Muslim countries contributed 1.17% of the world's science literature, whereas 1.66% came from India alone and 1.48% from Spain. Twenty Arab countries contributed 0.55%, compared with 0.89% by Israel alone. The U.S. National Science Foundation records that of the 28 lowest producers of scientific articles in 2003, half belong to the OIC. The situation may be even grimmer than the publication numbers or perhaps even the citation counts suggest. Assessing the scientific worth of publications is complicated further by the rapid appearance of new international scientific journals that publish low-quality work. Conventional wisdom suggests that bigger science budgets indicate, or will induce, greater scientific activity. On average, the 57 OIC states spend an estimated 0.3% of their gross national product on research and development, which is far below the global average of 2.4%. But bigger budgets by themselves are not a panacea. The capacity to put those funds to good use is crucial. One determining factor is the number of available scientists, engineers, and technicians. Those numbers are low for OIC countries. There are scientific areas in which research has paid off in the Islamic world. Agricultural research provides one case in point. Pakistan has good results, for example, with new varieties of cotton, wheat, rice, and tea. Defense technology is another area in which many developing countries have invested, as they aim to both lessen their dependence on international arms suppliers and promote domestic capabilities. According to a recent survey, among the 57 member states of the OIC, there are approximately 1800 universities. Of those, only 312 publish journal articles. For the top 20 universities, the average yearly production of journal articles was about 1500, a small but reasonable number. However, the average citation per article is less than 1.0. No OIC university made the top-500 Academic Ranking of World Universities. Most universities in Islamic countries have a starkly inferior quality of teaching and learning, a tenuous connection to job skills, and research that is low in both quality and quantity. Poor teaching owes more to inappropriate attitudes than to material resources. Generally, obedience and rote learning are stressed, and the authority of the teacher is rarely challenged. Debate, analysis, and class discussions are infrequent. At Quaid-i-Azam University in Islamabad, where I teach, the constraints are similar to those existing in most other Pakistani public-sector institutions. The campus has three mosques but no bookstore. No Pakistani university, including QAU, allowed Abdus Salam to set foot on its campus, although he had received the Nobel Prize in 1979. The Ahmedi sect to which he belonged was officially declared heretical in 1974 by the Pakistani government. As intolerance and militancy sweep across the Muslim world, personal and academic freedoms diminish with the rising pressure to conform. In Pakistani universities, the veil is now ubiquitous. My colleagues and I share a common observation that over time most students have largely lapsed into becoming silent note-takers and are less inclined to ask questions or take part in discussions. Science is under pressure globally, and from every religion. As science becomes an increasingly dominant part of human culture, its achievements inspire both awe and fear. In the Islamic world, antiscience materials have an immense presence on the internet, with thousands of elaborately designed Islamic websites, some with view counters running into the hundreds of thousands. Science, in the view of fundamentalists, is principally seen as valuable for establishing yet more proofs of God, proving the truth of Islam and the Qur'an, and showing that modern science would have been impossible but for Muslim discoveries. Although the relatively slow pace of scientific development in Muslim countries cannot be disputed, many explanations can. For example, it is a myth that women in Muslim countries are largely excluded from higher education. In fact, the numbers are similar to those in many Western countries. The near-absence of democracy in Muslim countries is also not an especially important reason for slow scientific development. Another myth is that the Muslim world rejects new technology. It does not. The ubiquitous cell phone, that ultimate space-age device, epitomizes the surprisingly quick absorption of black-box technology into Islamic culture. Some relatively more plausible reasons for the slow scientific development of Muslim countries have been offered. First, even though a handful of rich oil-producing Muslim countries have extravagant incomes, most are fairly poor. Indeed, the OIC average for per capita income is significantly less than the global average. Second, the inadequacy of traditional Islamic languages is an important contributory reason. About 80% of the world's scientific literature appears first in English. With the exceptions of Iran and Turkey, translation rates are small. According to a 2002 United Nations report, "The entire Arab world translates about 330 books annually, one-fifth the number that Greece translates." But the still deeper reasons are attitudinal, not material. At the base lies the yet unresolved tension between traditional and modern modes of thought and social behavior. Bread-and-butter science and technology requires learning complicated but mundane rules and procedures that place no strain on any reasonable individual's belief system. But science is fundamentally an idea-system that has grown around the scientific method. The deliberately cultivated scientific habit of mind is mandatory for successful work in all science and related fields. Scientific progress constantly demands that facts and hypotheses be checked and rechecked, and is unmindful of authority. The scientific method is alien to traditional, unreformed religious thought. Science finds every soil barren in which miracles are taken literally and seriously and revelation is considered to provide authentic knowledge of the physical world. If the scientific method is trashed, no amount of resources or loud declarations of intent to develop science can compensate. Religious fundamentalism is always bad news for science. But what explains its meteoric rise in Islam over the past half century? The West must accept its share of responsibility for reversing the trend. As secularism retreats, Islamic fundamentalism fills the vacuum. But Muslims do have a chance. One need only remember how the Anglo-American elite perceived the Jews as they entered the United States at the opening of the twentieth century. If Muslim societies are to develop technology instead of just using it, the global marketplace will insist on high skill levels and intense social work habits. Science can prosper among Muslims only with a willingness to accept certain basic philosophical and attitudinal changes. The struggle to usher in science will have to go side-by-side with a much wider campaign to elbow out rigid orthodoxy and bring in modern thought, arts, philosophy, democracy, and pluralism. In the quest for modernity and science, progressive Muslim forces have been weakened as a consequence of the confrontation between Muslims and the West. There can be no winners in that conflict. Science in the Muslim world is in a dismal state. The Organization of the Islamic Conference found that 20 Muslim states spent 0.34% of their GDP on scientific research from 1996 to 2003, or 14% of the global average. Fewer than 1% of their populations are scientists, engineers, or technicians, compared with the world average of 4%, and 14% for the developed world. They contribute only about 1% of the world's published scientific papers. Scientists in 17 Arabic-speaking countries produced fewer scientific publications in 2005 than Harvard University alone. There is no central church in Islam and thus no official position on scientific controversies such as evolution or cloning. There's no clear separation between church and state in most Muslim countries, so scientists lack the autonomy that they enjoy in the West. They must frequently contend with the scientific pronouncements of religious leaders. Many Muslims are especially bothered by evolution. By and large, Islamic culture is creationist. Many Muslims don't have a problem with the evolution of plants and animals but human evolution is a different story. According to the Quran, God created Adam out of clay, so the idea that humans descended from apes is simply beyond the pale for the vast majority of Muslims. Rana Dajani is a molecular biologist at Hashemite University, Jordan. She is often asked about specific Quranic verses when she teaches a course on evolution, and she points to other verses which she interprets as supporting natural selection. She says the biggest challenge for Arab professors is to get their students to think critically. Adnan Oktar is based in Turkey and distributes creationist media under the pen name Harun Yahya around the Muslim world. In 2008, Oktar claimed that the "Masons manage the world through a scientific dictatorship" and called Darwinism "a Satanic plot" that nurtures terrorism around the world, "like the development of mosquitoes in mud or in ponds." Seyyed Hossein Nasr is a native of Iran who teaches Islamic studies at George Washington University. He harks back to the philosophers of Islam's golden age, but Nasr also dismisses modern evolutionary theory as both bad science and flawed metaphysics. Ziauddin Sardar is a London-based social critic who has taken up the banner for "Islamic science". He says Western science "is inherently destructive, and it does not, and cannot, fulfill the needs of Muslim societies." Many Muslims point to Islam's golden age as proof that there's no conflict between Islam and science. What started as a movement to translate the scientific and philosophical texts of ancient Greece and India led to a remarkable flowering of science, philosophy, and theology. "Whole fields needed to be invented from scratch, such as algebra and the science of optics. Medicine and astronomy were also greatly pushed forward." Taner Edis, a Turkish-American physicist at Truman State University, Missouri: "It's a mistake to think of this as analogous to modern science. What Muslims were doing back then was still a medieval, prescientific intellectual enterprise. They never quite made the breakthrough, the Scientific Revolution, that took place in Europe."